At the end of a frustrating day, I opened my mail box and found just what a needed to lift my mood: a book with baby quilts sent for review. Not any book, mind you: the quilts in this book are gorgeous, with simple blocks as background to beautiful applique'. 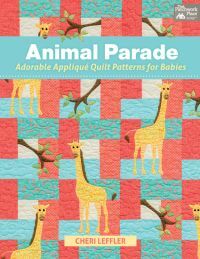 Animal Parade, Adorable Applique Quilt Patterns for Babies by Cheri Leffler features 10 quilt projects, each with a different animal: giraffes, owls, ducks, foxes, frogs, sheep, turtles and other sea creatures, koala bears, penguins, and monkeys. The quilt designs are stunning in their simplicity, accented by the appliqued animals which were almost all drawn by one of Cheri's daughters, Michelle. You could choose to use Cheri's needle-turn applique' method, explained in the first pages of the book, or use machine applique, which is what I will do. The book includes full-size patterns and large applique' shapes, as well as clear instructions and diagrams. Cheri has been quilting, teaching, and working with fabrics as a shop owner or staff for many years. I am glad she translated her amazing artistic talents into a book! I am moving to another town this week, so I will need to wait until my quilt room is organized before I can tackle another project. As soon as I am settled in, I will start the quilt with penguins, not shown here. I cannot wait!